GE 30 inch Free Standing Electric Self Cleaning Range, features a large 5.0 cu. ft. oven capacity that provides an impressively large interior for cooking more dishes and large meals at one time. This model features a glass-ceramic cooktop, made with a specially engineered ceramic glass that has an amazing resistance to both stains and impact. 2 Ribbon, 8 inch Heating Elements with ribbon heating elements, the heat comes from brightly glowing elements positioned beneath the smooth surface. Even heat is directed straight up to the pan for high speed heat-up. Provides a quick inch on inch with a bright visual response. Self-cleaning oven allows you to spare yourself from the trouble and effort it takes to scrub the oven interior. The oven does all the work! Increase the efficiency of your kitchen with this 24-inch GE electric range. It has two durable oven racks to hold heavy cookware, and the bake and broil modes let you conveniently prepare various recipes. The front controls of this freestanding GE electric range provide safe, easy access to temperature settings. Ideal for smaller spaces has all the features of a larger range. Cook smarter, not harder, with this GE 30 inch Free Standing convection range. Built-in Wi-Fi technology lets you control the oven from your mobile device to keep tabs on baking from outside or preheat before you step in the shower. This GE true European convection range includes an induction top for fast, even cooking. The 30-inch GE electric range carries a super-large 5.0 oven capacity; this remarkable large oven interior is ideal for holidays, dinner parties and everyday family cooking. The one-piece upswept cooktop eliminates crevices so dirt has nowhere to hide and cleaning is fast and easy. The handy Quick Clean storage drawer boasts a frameless design, which allows it to roll out completely without any obstruction. Whether you mop, sweep, or vacuum, every inch of your floor comes up completely clean. 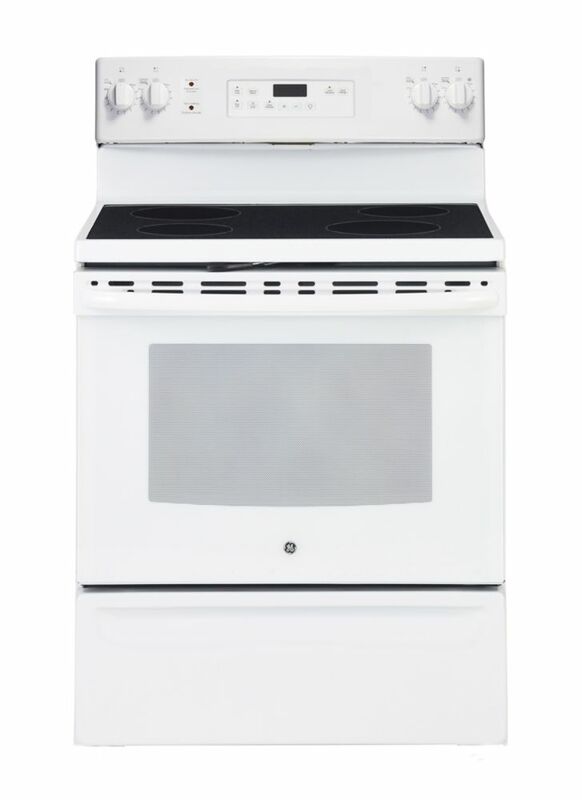 Cook multiple dishes with this GE Slide-In Front Control 6.7 cu.ft electric range. Its double convection ovens let you roast and bake at the same time, and its versatile Power Boil element accommodates 12-inch, 9-inch and 6-inch pots. Control this GE electric range remotely by connecting it to your smartphone via Wi-Fi. 30-inch 5.0 cu. ft. Single Oven Electric Range with Self-Cleaning in White GE 30 inch Free Standing Electric Self Cleaning Range, features a large 5.0 cu. ft. oven capacity that provides an impressively large interior for cooking more dishes and large meals at one time. This model features a glass-ceramic cooktop, made with a specially engineered ceramic glass that has an amazing resistance to both stains and impact. 2 Ribbon, 8 inch Heating Elements with ribbon heating elements, the heat comes from brightly glowing elements positioned beneath the smooth surface. Even heat is directed straight up to the pan for high speed heat-up. Provides a quick inch on inch with a bright visual response. Self-cleaning oven allows you to spare yourself from the trouble and effort it takes to scrub the oven interior. The oven does all the work! 30-inch 5.0 cu. ft. Single Oven Electric Range with Self-Cleaning in White is rated 4.2 out of 5 by 6. Rated 5 out of 5 by Captain Marvel from Looks Great, Works Great Just bought this a couple of days age to replace an old coil stove. I love the glass ceramic top, it heats fast and is easy to clean. The oven cooks food evenly. I do recommend to get the Cerama Bryte cleaning kit to keep it looking new. Rated 3 out of 5 by Power saver from I wish I bought JCB840DKWW The sabbath mode runs this device 24/7 (power waste) or does lit C sign 30-60 seconds after pressing a button (sabbath violation?). JCB840DKWW has a programmable start and end which solves both problems. Buy JCB840DKWW instead. Too quiet timer. If you want to leave the kitchen as you bake you will burn the food. Manual is for 4 different devices. The cool features are not on your model. Drives me crazy to learn how to do something and then learning "sorry not on your model". I paid for installation in the store, they did not install the anti-tip device. It is required in the manual. I got a great price on the product, and install, but I guess I got what I paid for. Rated 5 out of 5 by Aquarius02 from Great features I have had this for over a month now and pleased with its performance and glad I chose to purchase it! How do you clean the glass cook top? Good Morning, Use CERAMA BRYTE&reg; ceramic. Cooktop Cleaner and CERAMA BRYTE&reg; Cleaning Pad to clean the cooktop. Wait until the cooktop cools and the indicator light goes out before cleaning A wet sponge or cloth on a hot surface can cause steam burns Some cleaners can produce noxious fumes if applied to a hot surface Note:.Sugar spills are an exception They should be scraped off while still hot using an oven mitt and a scraper. Please check the use &amp; care guide for detailed instructions. Good day, this model doesn't have console light. Correct bottom element is exposed. Specs do not specify that it's hidden. 8 inch Heating Elements with ribbon heating elements Regards. is the bottom heating element of the stove really exposed? do you have pictures of the inside of the stove? Does this stove have an outlet on the cooktop? Good Morning, This model doesn't have the outlet.